Here is Stumps and Stones which refers to some of the pioneers of the community. I personally don't know where this originated. Perhaps someone can help me out with this. I am really unsure where these documents originated. You will see that it starts out with a will for Thomas Legg dated 1808. There are several pedigree charts and handwritten notes throughout. I did find a small error referring to my father as Emory George Kincaid. His middle name was Garfield. This might explain some of the errors I have found lately with other pedigree charts showing up with the middle name incorrect. Update: This file has been compressed and made searchable. Here is the McClung Genealogy by Rev. William McClung dated September 1, 1904. I was unable to compress this file and make it searchable so it is quite large. I will try to make the file more manageable when I find time. I really like this old photo. I'm hoping I can enhance it and get it printed and matted. It has really got me thinking about it though. I don't remember hearing much about it as a kid. Of course it was way before my time. But then again, I would have probably not have been interested anyway. Of course that is just my guess based upon extending the road in Fayette County. I just received additional information on this bridge from Roger Legg who is the Great Great Grandson of Thomas Shawver (builder of Shawver's bridge). I have placed this information in italics to differentiate it. Mt. Lookout is a rolling plateau of fertile land about three or four miles long and about a mile or so wide. To the west and running at the side of the plateau is a narrow canyon or gulch several hundred feet deep where Meadow River roars on its way toward the ocean as it cascades over the boulders in its bed. In 1882 Tom Shawver bought a narrow parcel of land in the bottom of this canyon alongside the river. He harnessed the power of the river and installed a grist mill (a mill for grinding corn meal, graham flour, etc. ); then, a flour mill (mill with rollers, sieves, etc.) capable of grinding wheat and separating it into its various products (flour, middlings, bran, etc.). He engineered a device to use the power of the river to operate a sawmill. First. a rip-saw (a straight saw blade that was thrust back and forth across the log to rip in into boards (Operated by hand by early settlers). Later, his overshot waterwheel power system was changed to a turbine. He installed a circle saw and a planing mill. He also operated a blacksmith shop. In the meantime the community and his business were in need of a bridge across this violent river which was too swift and rough to ford or ferry. So in 1884, Tom Shawver and his stalwart sons engineered and built a toll bridge 25-ft. above normal water level. 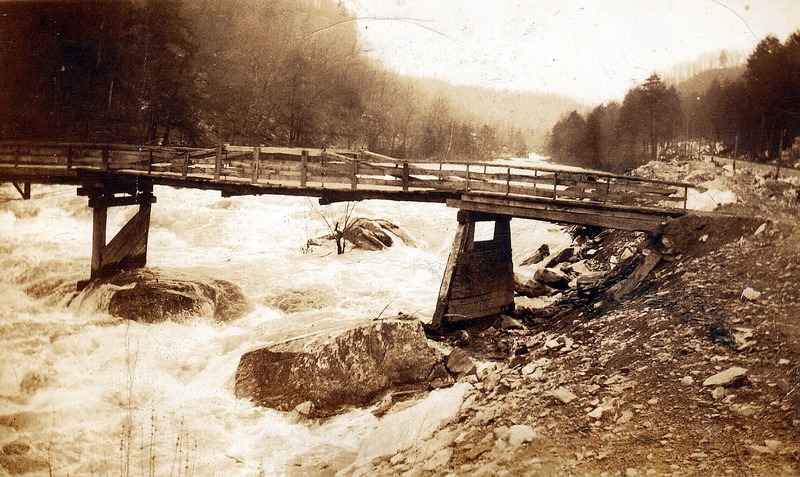 This bridge, built of timbers from the forest, was over one hundred feet long and consisted of a number of spans bearing on the huge boulders in the riverbed. He also constructed a road through a gap in the cliffs of the canyon wall on the Mt. Lookout side. 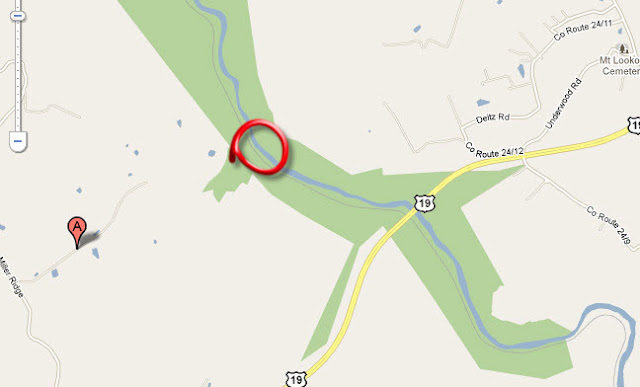 Fayette County built a road to the other end of the bridge. Toll was five cents for pedestrians and ten cents for wagon, etc. No toll, if going to worship, funeral or mill. This proved to be one of the most used highways in the area, second only to the Kanawha-James River Turnpike, which ran about where US Rt. 60 now is and connected James River, VA to Charleston, WV. This bridge stood for many years. The description of the bridge certainly fits the picture shown above. Mr. Shawver was quite the entrepreneur from what we see here. I would love to get more information on the mills and blacksmith shop. I really want to thank Roger for this. Here is another publication from Legg's Press. I'm not sure of the date. The title page says "A few historical records relative to Mount Lookout and other communities including Anecdotes of the Pioneers by Crosby McClung and Some Old Records by W.D. Halstead. The rest being by W.C. Legg".